Far too often, the assessment process is cumbersome and time consuming. ExamSoft was created with educators in mind—to make testing an easier, streamlined process for everyone involved. From categorizing and tagging exams to running detailed reports on student performance, ExamSoft helps your educational program with the entire assessment process. The ability to categorize, or “tag,” exam items is the most important feature of an assessment software. By categorizing exam items to student learning outcomes, course/program objectives, or even accreditation standards, educators are provided with detailed information on how students are performing within these specific outcomes—from the moment of their first assessments. This assessment method brings several benefits to the table—the most important being the ability for educators to understand exactly how students are performing not only at the course level but to specific outcomes for that course as well. With standard testing, it can be difficult to gauge where students need specific help—a number out of 100 doesn’t provide feedback on which areas they excel in and which they need the most support. With more pinpointed data, faculty can make informed decisions on student remediation or curriculum revision tactics to affect performance in a proactive way from day one. On top of student performance, categorizing provides faculty with a clear picture of curricula performance as well. Knowing which sections of content or topics students are struggling with helps faculty understand where curriculum gaps are occurring and how to go back to review as necessary. Instructional methods can also be used as categories to help understand which of these methods is helping students better understand and absorb content. ExamSoft’s Rubrics tool can help you tackle the many forms of learning activities within your curriculum by building personalized rubrics that fit your assessment needs. Whether it’s an essay, a group project, or an individual performance, educators can run data-driven reports to quantify student performance, no matter the type of assessment. Rubrics offer educators an easy and efficient way to objectively evaluate more subjective forms of assessment. This provides a clear and concise playing field for students to understand what they will be assessed on and for educators to stay on target while assessing. When you couple the efficiency of online rubrics creation with the ability to also tag each rubric criteria (row) to the same categories as you would a traditional multiple-choice question exam, you’re now using an incredibly powerful way to assess students while also saving time. With less time spent on building rubrics, educators can focus more on tweaking their curriculums to student needs after receiving valuable and cohesive information from assessment results. With exam item and rubrics categories in place, assessment reporting is both easy and incredibly powerful. Now, several variations of reports can be run to assist students with self-directed study, faculty with item and curriculum review, and programs with preparing for accreditation preparation. Reporting is only as useful as the information you are distributing and how quickly it can be distributed and absorbed. Post-assessment feedback reports should be customized to be as helpful to students as possible and be delivered in a timely manner. Performance feedback from assessment one won’t be any help to students who are now working on content for assessment three. Educators need the ability to share feedback that is detailed, personalized, and easy for students to access and digest. Understanding student performance is paramount for faculty, as well. By having insight into the specific topics that students are excelling at or struggling with, educators can adjust lectures, course work, and even their assessments as necessary. New teaching methods can be deployed and remediation can be implemented, and connecting with students on an individual basis becomes much easier and effective. Assessing student learning becomes much easier and useful when an assessment software is used. 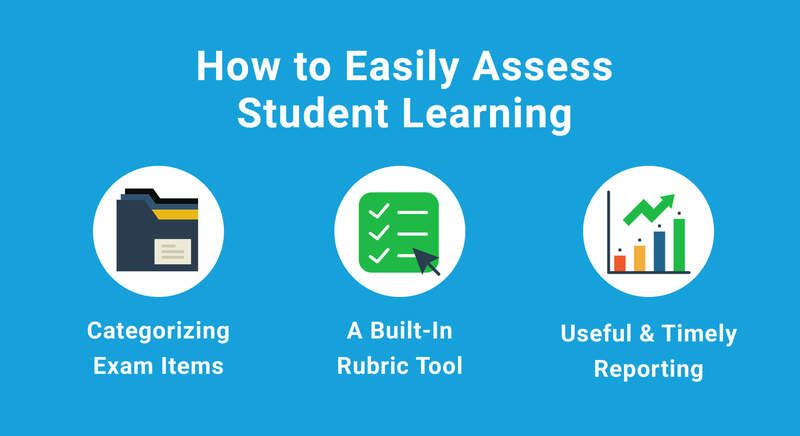 By categorizing exam items and rubrics tools, both students and faculty can take advantage of the ability to gain a much more detailed understanding of what is going well (and maybe what isn’t) in the learning process. To learn more about how the process of assessing student learning takes place, click here.